When I chose to do a Spring marathon, I knew I would be training in the cold. Luckily I didn’t know it would be this stinking cold, or I may have rethought the whole plan. During our first week of training, the temperatures began their plummet. Most runs have been in numbingly cold temperatures (usually less than 20 degrees). No those aren’t highlights. 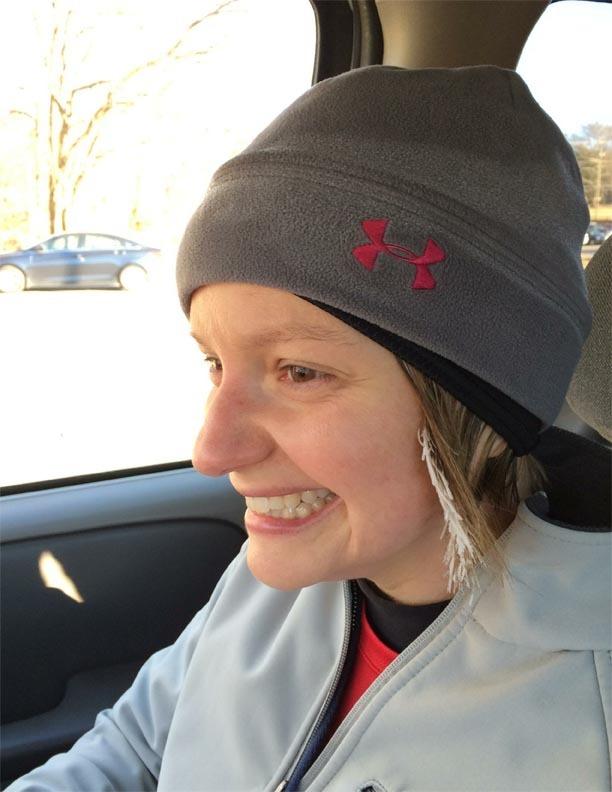 My friend Abby’s hair recently froze on a long run. Your knee is sore? It will take it about 3 hours to thaw out from your run. No need to tote around an annoying ice pack. Not that we’re super good at shaving in the winter, but this year we can definitely justify an extra layer of fur: we need that insulation. No need to worry about your drinks getting warm on your run, actually the opposite has happened: our drinks freeze sometimes. When our chocolate ‘goo’ freezes we just pretend it’s a fudgesicle. I get to wear my fleece lined Lulu pants, and they are super cozy even in this obnoxious weather. They have an extra panel of fleece on the backside to keep your glutes extra warm. When we actually do run in temperatures above 20, it feels so amazing. We are following Hal Higdon’s Novice 2 plan, and this week we ran 12 miles. We started in downtown Franklin and did an out and back on Del Rio. 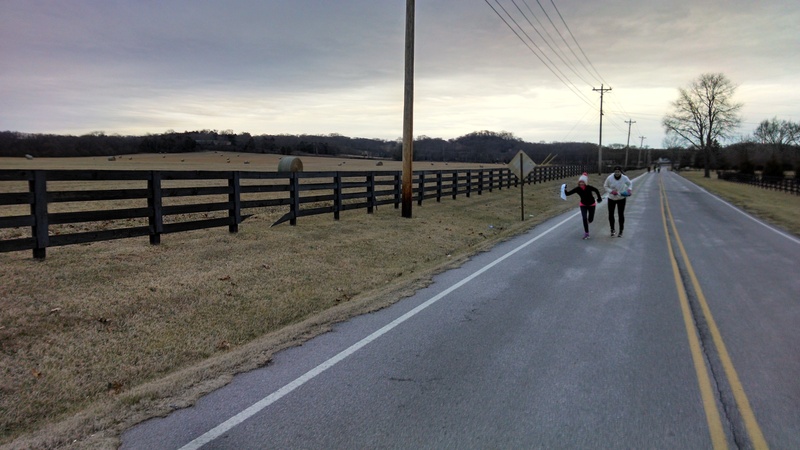 Wooden fenced hay fields, country bridges and gorgeous homesteads made this a beautiful quintessential Williamson county run. It was 20 degrees, which was tolerable after we were warmed up. That last mile, my legs felt heavy, like I had a toddler clinging each of them. But when we rounded the corner and saw downtown, I felt like a horse headed back to the barn. After our run, we drove 2 blocks to Frothy Monkey for lattes to warm up. Walking a step further than our Garmins told us we had to seemed ridiculous. This entry was posted in Running, Uncategorized and tagged country music marathon, marathon training on January 31, 2014 by drrupe. I am currently registered to run the Country Music Marathon on April 26, 2014. Despite being a runner for the last 17 years, I have never ran a full marathon. In my early 20’s, I did races all the time, but never more than a 15 K (The Tulsa Run, which is still my favorite race). Over the years the responsibilities of life kept my running to 3-4 miles a couple of times a week, barely enough to stay fit. Something quite terrible happened when I hit my mid 30’s. Running alone wasn’t enough to stay fit. Despite staying active, my pants were no longer fitting. Rather than buy a new wardrobe, I started eating healthier. Over the last 2 years, I began to eat “paleo-ish” and do crossfit in addition to running. These changes have made a huge difference in my energy and fitness level. At 38 years old I set a PR this fall for my half marathon (1:48). For the first time since high school, I feel like an athlete. Running a marathon is not a decision I have made lightly. I’ve counted the costs. Literally, I made a spread sheet to determine how many hours it would entail to properly train. I choose my “slowest” time at work (first quarter) and picked a time when we have no other major commitments. Since I made the decision, I’ve been almost giddy with excitement. Devouring books on running and nutrition. I can’t quite find the proper words to express just WHY this means so much to me, but I get teary every time I picture myself crossing the finish line. Running is something I truly enjoy, but it can be time consuming. I’m done with most of my runs before my kids wake up, but I still struggle with working-mom guilt over spending my time exercising. But taking care of my self is not a luxury. I’ve realized that running is my sanity, and it’s OKAY to be sane. This marks my 5 weeks of training, so far I haven’t missed a run. Anyone else out there training for the full Music City Marathon? This entry was posted in Running and tagged country music marathon, crossfit, marathon training on January 21, 2014 by drrupe.